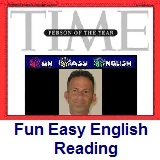 ﻿ Fun Easy English - reading practice and learning about the holiday Rosh Hashana. Rosh Hashanah (Hebrew: ראש השנה‎, literally "head [of] the year"), is the Jewish New Year although the real name for this Feast of the Lord is called Yom Teruah (Hebrew: יום תרועה‎, literally "day [of] shouting/raising a noise") or the Feast of Trumpets according to the correct biblical calendar of the 1st and 2nd temple period, not Rosh Hashanah. It is the first of the High Holy Days or Yamim Nora'im ("Days of Awe") which usually occur in the early autumn of the Northern Hemisphere. Rosh Hashanah is a two-day celebration, which begins on the first day of Tishrei. The day is believed to be the anniversary of the creation of Adam and Eve, the first man and woman, and their first actions toward the realization of mankind's role in God's world. Rosh Hashanah customs include sounding the shofar (a hollowed-out ram's horn) and eating symbolic foods such as apples dipped in honey to evoke a "sweet new year". The common greeting on Rosh Hashanah is "Shanah Tovah", which, in Hebrew, means "[have a] good year" or similar greetings. Thus, in Yiddish the greeting is "ah gut yohr" ("a good year") or "ah gut gebentched yohr" ("a good blessed year"). Serious greetings and blessings, based on the nature of the day, commonly used among religiously observant Jews are "Ketiva VeChatima Tova" which means "[may you be] written/inscribed and sealed [for a good new year i.e. by God]." After Rosh Hashanah ends, the greeting is abbreviated to "Gmar Chatima Tova" ("[may you be] finally sealed [for a] good [year by God]") until Yom Kippur. After Yom Kippur is over, until Hoshana Rabbah, as Sukkot ends, the greeting is "Gmar Tov" ("[a] good conclusion [of God's judgment]"). The above describes three important stages as the spiritual order of the Ten Days of Repentance (the ten days between Rosh Hashanah and Yom Kippur) unfolds: On Rosh Hashanah God "'opens' the 'books' of judgment" of creation and all mankind starting from each individual person, and in those books it is first "written" what will be decreed, hence the emphasis on the "ketiva" ("writing"). The "judgement" is then "pending" and prayers and repentance are required. Then on Yom Kippur, the judgment is "sealed" or confirmed (i.e. by the Heavenly Court), hence the emphasis is on the word "chatima" ("sealed"). But the Heavenly verdict is still not final because there is still an additional chance and positive expectation that until Sukkot concludes there is hope that God will deliver a final good and favorable judgment, hence the use of "gmar" ("end") that is "tov" ("good"). Rosh Hashana is the Jewish New Year. A very happy and healthy New Years to all the Jewish visitors to Fun Easy English. 1. Rosh Hashana literally means which of the following? 2. Rosh Hashanah is which of the following? 3. Rosh Hashanah is a two-day celebration, which begins on which of the following? 4. Rosh Hashanah customs include which of the following?